German sports goods maker Adidas has announced record profits for 2016, beating analysts' expectations. The Bavaria-based company said net profit topped a billion euros for the first time in the firm's history. The firm said Wednesday that annual net profit increased by 60.5 percent, to 1.02 billion euros ($1.07 billion). The announcement was a surprise to analysts, beating their predictions and the company's own forecast. Chief Executive Kasper Rorsted hailed 2016 as an "exceptional year" for the company, with double-digit growth in almost all regions of the world. It was a big year for sports that featured the Olympic Games in Rio and the European Football Championships in France. Much of 2016's success for Adidas was down to strong growth of 16.6 percent at its central three-striped brand, accounting for the biggest share of its revenues. Subsidiary Reebok grew much more modestly at 1.1 percent. Overall revenues increased 14 percent to top 19 billion euros. The company also unveiled an optimistic forecast for this year. They predicted revenue growth of between 11 and 13 percent, adjusting for currency effects, and aim to increase profits by 18-20 percent to around 1.2 billion euros. Citing its strong results, Adidas said it would offer shareholders a dividend of 2 euros per share for 2016, up from 1.60 euros the previous year. After the news was announced, shares in the company leapt on the Frankfurt Stock Exchange. In early morning trading, the stock gained 9 percent, which added $2 billion to its market value. By mid-day it was still up over 7 percent, trading at around 171 euros per share. 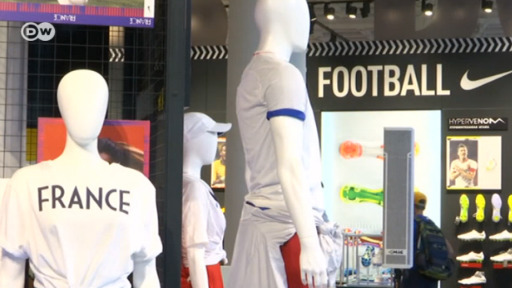 Football fans will have to wait until Sunday's World Cup final to see whether France or Croatia wins, but the battle among sports fitters has already been decided. Adidas bet on Germany, Spain and Argentina to carry its brand through, but they've since been sent home. Nike, who's sponsoring both teams in the final, has gotten the better of its long-time rival. From now on, German eSports will be supported by a national association. Can eSports become an actual sport in Germany? Violent games are still causing trouble in that regard.